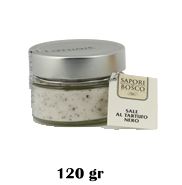 Product composed of sea salt and black truffle. It can be consumed at room temperature. Excellent to season pasta, risotto, meats, eggs, cheeses, salads, potatoes, eggs, vegetables.